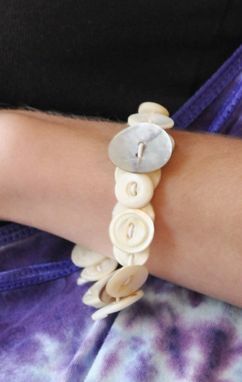 What better way to display a collection of vintage mother-of-pearl buttons than as a simple bracelet. It reminds me of rummaging through my aunt's cookie tin of buttons. These buttons are strung on an elastic cord, making it easy to wear. All of these buttons were rescued from old shirts, making this bracelet as eco-friendly as it is beautiful.